Shalique Brown, Biology major, is leading the effort to establish a sorority based at MGA's Cochran Campus. Full Name: Shalique Quynia Brown. High School: "I attended Collins Hill High School in Suwanee, where I was in the marching band, playing bass clarinet. I was also on the senior cabinet." Family: "I am the oldest of four children. I am a decade older than the second oldest." Employment: "I work in MGA's Office of Admissions on the Cochran Campus as a student assistant. I am team leader of the Knights Ambassador program and give tours to prospective students who are interested in becoming a Knight at Middle Georgia State University." Activities: "I am the president of the up-and-coming sorority, Kappa Delta Chi, at Middle Georgia State. We are working on obtaining colony status by doing community volunteering , hosting events on campus for students and providing an environment where young women on campus can gain leadership skills." Career Goals: "I want to work in the medical field, maybe in anesthesiology or obstetrics. The medical field is where I think I can impact lives in a positive way." 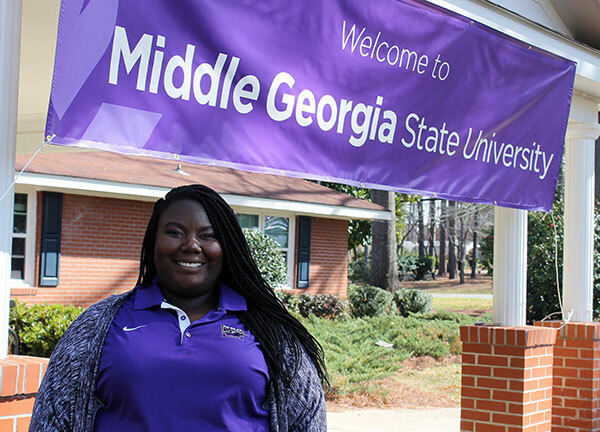 She chose Middle Georgia State University because … "I felt that I would grow with the state's newest university. I saw the opportunities the Middle Georgia State University has to offer and I wanted to be part of starting traditions that will last long after I graduate." The greatest thing she discovered about Middle Georgia State was … "The faculty and staff and how generous and patient they are with students. They care so much about making sure their students grasp the knowledge that is being shared with them. I also love not having classes on Fridays. Having three-day weekends are a plus because I have more time to study." Her greatest academic experience as a Middle Georgia State student has been … "Learning biology and chemistry and making the dean's list." To her, greatness means … "Getting up every morning with goals and completing those goals no matter how big or small they may be." One thing people don’t know about her is … "I enjoy classic films and classical music. I also like to watch independent movies." In five years ... "I hope to be working in a hospital and, perhaps, working on an MBA."